There’s an unusually thoughtful piece in this week’s Economist on the worldwide debates over medicines, patents and innovation. Unlike a lot of Economist reporting, it’s not overly ideological. Maybe the most interesting point is in the whole article is this: “in part because health budgets are small, drugs often already account for a bigger share of health spending in poorer countries than in rich ones. 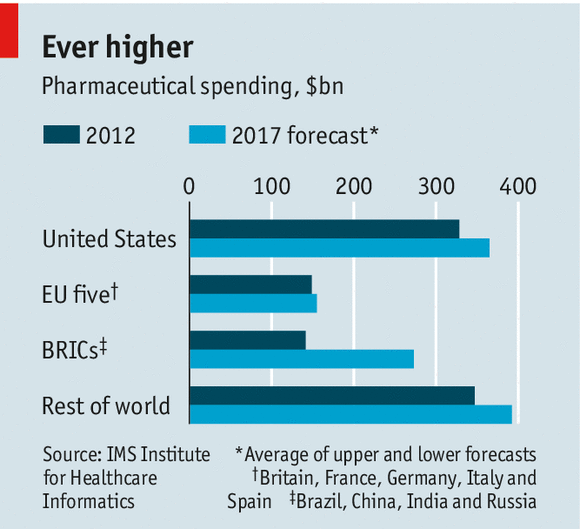 India spends 44% of its total on drugs and China 43%. America and Britain spend 12%.” Public health budgets are, of course, much smaller in India than in the USA: about 1.2 percent of GDP versus about 10 percent in industrialised countries. The piece highlights the difficulties of any schemes to improve access to medicines although it goes softly on generics companies which often price at very different levels in different countries although they have none of the costs of research or innovation that the big companies bear. It also glosses over the very successful model of tiered pricing in the vaccine industry: richer countries pay much more for vaccines than poorer countries do. The odd fragment of an interview with Seth Berkley of GAVI, the global vaccine organisation, suggests that an editor didn’t understand the point or that it got cut to make room for yet another of the magazine’s tiring rants on the need for deregulation. It’s a pity: despite the efforts of Latin American countries to freeload, the model of vaccines suggests that there is a fairer way to price things and to still reward those who make big scientific discoveries.